Though robotic arms are being around since a long time now but still we can do lot of improvements in existing designs. For example, Project in which we can control it using internet or wireless rays. 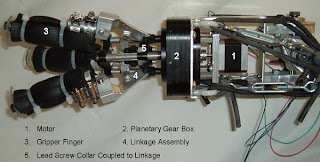 We have seen how NASA can control arm of Discovery Robot on Mars from Earth.We can also think something out of the box. For the arm which can be controlled over internet we will need two computers(Client and Server).For Client computer we will use ebox-2300SX and for server we can use any Personal computer. 6)AL5A Arm Frame for servos: The AL5A robotic arm delivers fast, accurate, and repeatable movement. The robot features: base rotation, single plane shoulder, elbow, wrist motion, a functional gripper, and optional wrist rotate.